Welcome to Cardiff! Hometown of my favorite dreamy Welshman. The Cardiff skyline as viewed over the castle walls. Castell Caerdydd is located in the middle of downtown  just walk across the street and you're at the castle gates! 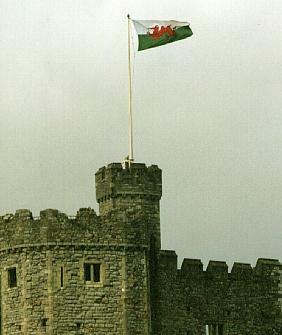 The flag of Wales  with that ubiquitous red dragon  flies high on a castle tower. 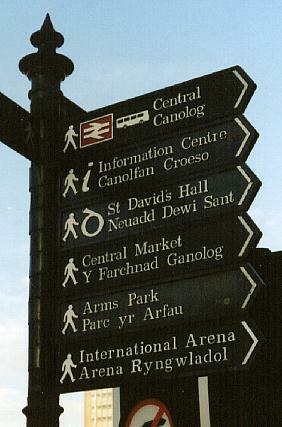 Yes, all the street signs are in Welsh too! Peter once remarked that Brains Dark was his favorite brand of beer. I had no idea what that was until now. 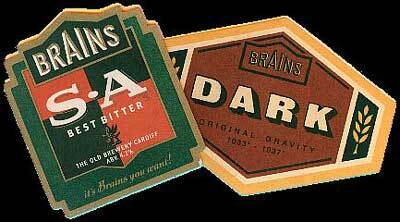 Seems it's the local brew  everywhere you turn in Cardiff you can see billboards for Brains with the slogan "It's Brains you want!"